The Plasmodiophorida, or plasmodiophorids are a group of microscopic organisms that live as parasites within the cells of higher plants, algae or oomycetes. They are difficult to study and are probably overlooked but the best studied members infect the roots of crop plants where they may cause damaging growth abnormalities (such as the club root of cabbage) or transmit harmful viruses (particularly in sugar beet and small grain cereals like wheat and barley). There are interesting and unique structures used to penetrate their host cells and a distinctive ‘cruciform’ appearance to the dividing nuclei. The plasmodiophorids have a number of distinctive structural features in their life cycle. They have resting spores that can survive for many years in various environments and these germinate to produce zoospores (swimming spores) that are propelled by two flagella of unequal length. These attach to the outside of the host and penetrate the cell wall with a specialised penetration device that injects the cytoplasm into that of the host. 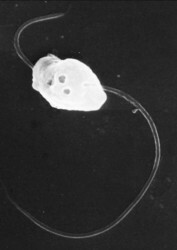 The parasite nuclei divide by an unusual and characteristic ‘cruciform’ type of nuclear division to produce a multinucleate protoplast or plasmodium (from which the group is named). The resting spores are not particularly distinctive but the way in which they are arranged has been useful in classification. Thus, for example, in Plasmodiophora, the resting spores are single (unattached) although produced in large masses in infected root galls. In other genera, the spores are joined into small groups (Tetramyxa, Octomyxa), layers (Sorodiscus, Membranosorus), irregular clusters (Polymyxa, Ligniera, Woronina), hollow spheres (Sorosphaera) or spongy masses (Spongospora). The zoospores produced when the resting spores germinate (primary zoospores) are heterokont (have flagella of two unequal lengths) and are of the smooth ‘whiplash’ type. In those genera that have been studied, the host cells are penetrated by a specialised structure named a ‘Rohr and Stachel’. The Stachel is fired through the cell wall and the contents of the zoospores follow rapidly. Inside the host, the mitotic nuclear division is of an unusual ‘cruciform’ type in which the nucleolus is elongated perpendicularly to the plane of the metaphase chromatin. Distinct chromosomes cannot be seen or resolved by microscopy. This division results in a multinucleate plasmodium, which then becomes a sporangium as it cleaves into the secondary zoospores (which are morphologically identical to the primary ones). The morphology of the sporangium and ultrastructural features of the zoospore (particularly the kinetosome at the base of the flagella) differ between genera. It is clear that plasmodiophorids belong in the Cercozoa and seem to be most closely related to the Phagomyxida (Phagomyxa spp.) and Maullinia, parasites of diatoms and filamentous algae. The phylogeny within the group is not well-established and is based on a small number of characteristics of the better known members. The tree presented is based on 18S ribosomal sequences for Plasmodiophora, Spongospora, Sorosphaera and Polymyxa with some additional support from analyses of the ITS region. There are no molecular data for other genera and few distinguishing morphological characteristics. Even for the better-known members, some details are uncertain. Although what appears to be a meiotic (reduction) division takes place during the development of the resting spores, nuclear fusion has never been convincingly demonstrated. 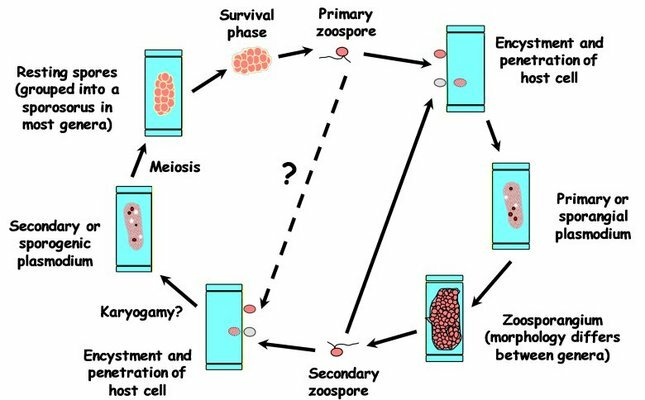 It is also unclear what triggers the change from the (zoo)sporangial to the sporogenic (resting spore) stage of the life cycle and whether primary zoospores can directly initiate the sporogenic stage. Many members cause galls or other growth distortions on the roots of the plants that they infect. Plasmodiophora brassicae causes clubroot, a disfiguring and debilitating root disease of cabbage and other brassicas. This disease occurs worldwide and can make land unsuitable for brassica production because the resting spores persist in soil. There are limited options for chemical control but plant breeding has been used to produce varieties that are more resistant to the disease. Polymyxa species are not associated with growth abnormalities but are important as vectors of viruses that cause serious diseases worldwide. Viruses transmitted by Polymyxa graminis include Barley mild mosaic virus, Barley yellow mosaic virus, Oat mosaic virus, Peanut clump virus, Rice stripe necrosis virus, Soil-borne wheat mosaic virus, Soil-borne cereal mosaic virus, Wheat spindle streak mosaic virus and Wheat yellow mosaic virus. P. betae transmits Beet necrotic yellow vein virus (BNYVV) which causes rhizomania, a seriously damaging disease of sugar beet, in many parts of the world. 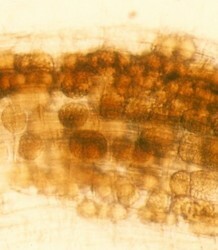 Spongospora species infect potato and watercress, causing growth distortions that reduce saleable yield. 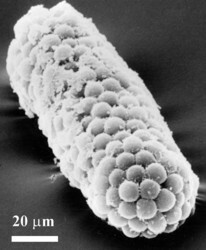 Spongospora also transmits Potato mop-top virus and is the proposed vector of Watercress yellow spot virus. It has been reported that Sorosphaera may cause galls on roots of grapevine. Traditional taxonomy placed the plasmodiophorids as ‘lower fungi’ but it is now clear that they are not related to either the true fungi or the Oomycetes (e.g. Phytophthora). Classification into genera is still largely based on microscopic characteristics, particularly the arrangement of the resting spores and the morphology of the zoosporangia. More recently this has been supported by ultrastructural studies of the zoospores and of synaptonemal complexes, and for some species ribosomal DNA sequence data. Other names for the Plasmodiophorida/plasmodiophorids (depending on taxonomic rank) are: Plasmodiophoromycetes, Plasmodiophorea, Plasmodiophorales, Plasmodiophoracea, Plasmodiophoridae. 1. Braselton, J. P. (1988). Karyology and systematics of Plasmodiophoromycetes. In Viruses with fungal vectors. (Cooper, H. & Asher, M., eds. ), pp. 139-152. Association of Applied Biologists. 2. Braselton, J. P. (1995). Current status of the plasmodiophorids. Current Reviews in Microbiology 21, 263-275. 3. Kanyuka, K., Ward, E. & Adams, M. J. (2003). Polymyxa graminis and the cereal viruses it transmits: a research challenge. Molecular Plant Pathology 4, 393-406. 4. Karling, J. S. (1968). The Plasmodiophorales, Hafner Publishing Company, New York. 5. Ward, E. & Adams, M. J. (1998). Analysis of ribosomal DNA sequences of Polymyxa species and related fungi and the development of genus- and species-specific PCR primers. Mycological Research 102, 965-974. 6. Ward, E., Motteram, J., Kanyuka, K. & Adams, M. J. (2005). The use of PCR methods for Polymyxa graminis to study intraspecific variation, phylogeny and inoculum levels. In Proceedings of the Sixth Symposium of the International Working Group on Plant Viruses with Fungal Vectors (Rush, C. M., ed. ), pp. 100-103. American Society of Sugar Beet Technologists, Denver, USA. Plasmodiophorid Home Page. Detailed information on the properties and classification of the Plasmodiophorida from Jim Braselton. Molecular Studies of the Plasmodiophorids. DNA-based procedures and information. International Working Group on Plant Viruses with Fungal Vectors. Contact details for researchers interested in the plasmodiophorid vectors and the viruses they transmit. Spongospora home page. Pictures and information on the genus Spongospora. Page: Tree of Life Plasmodiophorida. Authored by Elaine Ward and Michael Adams. The TEXT of this page is licensed under the Creative Commons Attribution-NonCommercial License - Version 3.0. Note that images and other media featured on this page are each governed by their own license, and they may or may not be available for reuse. Click on an image or a media link to access the media data window, which provides the relevant licensing information. For the general terms and conditions of ToL material reuse and redistribution, please see the Tree of Life Copyright Policies.